Just so everyone knows how 3Gstore.com works, is that we put the customer first (see our Customer Service isn't Rocket Science Blog post). We had an issue with a company that usually makes top notch products. They made a black, red, and white battery case for the iPhone 4/4S. 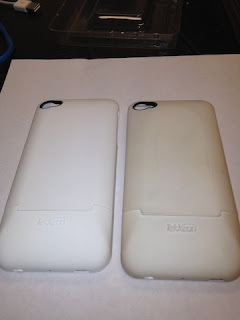 We had a few reports from customers that their white case changed colors. We thought the customer's case got dirty. After getting the case back, we noticed it wasn't dirty, but had become discolored. We immediately pulled them from our web site, so nobody else could order and we notified Tekken and they were working on a fix (BTW, Black and Red do not have this problem). Today, we had a customer thinking we were out of stock of the white case because he couldn't find it on our site. So, we promise to communicate better with our customers in the future. Today, we are re-enabling the white iPhone battery case with the actual picture. As soon as Tekkeon fixes this problem, we will update our sites.